"What?" Rosia gasped, turning to face the dark alley. "Who's there? Answer me!" "Maybe it's one of t-those other Top F-Faeries?" Daphne suggested, still shivering from the cold. "We'll just see about that," Rosia said as she sent purple sound waves towards the alley's two garbage bins. As soon as the two bins had flown out of her way, Rosia continued to strike the alley until she heard someone howling from the alley's interior. An extra blow revealed a shaggy-haired Ixi, whose teal coat and familiar hemp sack made Rosia and her sisters glare at one of Neopia's famed bandits: Hanso. "What were you doing there?" Rosia demanded, pointing towards the dark alleyway. "Oh, I was just taking an evening stroll," Hanso explained. "So how are you four lovely ladies doing on this fine night?" Daphne stammered, "I'm... freeze... freezing!" "And I'm furious with you!" Rosia shouted. "And why is that?" Hanso wondered. "I've never seen any of you Dark faeries before." Violet placed a hand to her forehead and hummed. After a minute, she looked at Hanso and said, "While you may not have met us, you have had an encounter with our mother when Faerieland was still a city high above in the sky. And according to my vision, our mother had threatened you with a curse because of something that you'd done: you stole the Amulet of the Dark Faerie!" Violet gasped in disbelief. "That can't be! How could Hanso steal the amulet from our mother and-"
"He didn't steal it from our mother, Violet," Rosia interrupted, her voice rising as she spoke. "Before Faerieland crashed to the surface of Neopia, Queen Fyora had placed the Amulet of the Dark Faerie inside the Hidden Tower for safe keeping. Apparently the amulet possessed a great deal of dark magic, and Fyora didn't want to risk the safety of Faerieland, so she decided to store it in the one place that she knew our mother wouldn't find." "So Hanso s-stole the amulet from the H-Hidden Tower then?" asked Daphne, who was still shivering from the cold. Hanso sighed and shook his head. "Look girls, I didn't steal any Dark faerie amulets from the Hidden Tower! I mean sure I stole some gems, and a gold coin or two, and there was this cool hat that I found-"
"Then where is it!" Rosia exclaimed impatiently. She lifted up Hanso by his coat's collar and shouted, "Every Dark faerie in Faerieland knows that a putrid, crooked thief from the supposed 'Thieves Guild' broke into the Hidden Tower at night and stole the amulet! And although I had already infiltrated your stupid little club and threatened every thief, including that puny Kanrik that everyone likes for some reason, with my faerie magic, not a single thief confessed for stealing MY amulet and for what they did to our mother!" "Whoa, calm down," Hanso pleaded. "Can you at least put me down before you continue with your rant?" After being thrown to the ground, he got up and dusted all the dirt off his coat. "Good, now that I'm on the ground, I can remind you that I was once in the Thieves Guild. That is before they kicked me out... but I don't think you faeries need to know why, so I'll go on ahead." "Please do," said Rosia, crossing her arms. "I'm waiting." "Well," Hanso said nervously, "there may have been an incident that happened at the Hidden Tower that could have contributed to the amulet's disappearance. Unfortunately, I can't remember what it was, so can I just leave and we can all forget what had happen tonight?" Desperate to leave, Hanso gave each of the Dark faeries a pleading look that begged them to spare him mercy. But instead of falling for Hanso's plea, Rosia rolled her eyes and asked, "Did you hear anything that we've been talking about, Hanso?" Hanso shook his head. Then he turned towards the Hidden Tower and blinked his eyes, not believing what he was looking at. "Is that stone thing... what I think it is?" "Yes," said Rosia, "that thing is, or was, the Hidden Tower." She glared down at Hanso and barked, "And if you dare to disobey my orders, then you would share the same fate as that ugly tower! Do you understand me?" "Yeah, sure," Hanso stammered. "I'll do whatever you want!" "Excellent," said Rosia. "And because I've heard that you have quite a reputation in Faerieland for your thieving skills, I need you to break into a certain Air faerie's house and steal something from her while she sleeps. Can you do that?" "Of course I can!" Hanso said eagerly. "But what do you want me to steal from her?" "The Circlet of the Air Faerie," Rosia explained. "And a warm sweater if you can find one!" Daphne piped up. Rosia gave Daphne a scowl. Then she turned to Hanso and said, "If you can get me this certain 'treasure' by sunrise, then I will let you go and pretend that you have nothing to do with my missing amulet. Do you understand?" Rather than disagreeing with Rosia, Hanso nodded his agreement. Rosia watched with pleasure as her newest recruit ran off towards Faerie City. "Thanks for allowing me to sleep over at your house, Kira," said Illere. She was unrolling a green sleeping bed in front of Kira's bed. "No problem," said Kira. "I'm glad to have a friend sleep over! Are you sure Sirena would be okay, though?" Illere nodded. "All she needs to do is cry and then she'll be a-okay! She should be expected to cry all night, though." "Oh," said Kira, tucking herself into bed. Just before she turned her bedside lamp off for the night, Kira got up and walked over to her bedside window. After chanting "Shieldis!" a light blue shield began to surround Kira's neohome. As soon as the shield was up, Kira went back to her bed and re-tucked herself in. "What did you do?" asked Illere. "I just put up a defensive while over the neohome," Kira explained. "My mom told me to do this every night since that battle we had with Rosia and her sister." "Ah," said Illere as she yawned. "Good night, Kira." As soon as Kira fell asleep, Kira turned her lamp off and closed her eyes. After what felt like hours, Illere began to shake Kira awake. "Wake up!" she whispered. "It's an emergency!" "What...?" Kira asked as she opened her eyes. She looked up at Illere and rubbed her eyes awake. "Illere, what is it? I was busy sleeping!" "I heard something downstairs!" Illere said in a loud whisper. "It was near the kitchen; I heard it while I was fetching myself a glass of water. Would you please come with me downstairs in case it's an intruder?" Still half-asleep, Kira nodded and followed Illere down the stairs and towards the kitchen. Once they were inside, both faeries scanned the kitchen for any signs of a break-in. "Well, I don't see anything," Kira yawned. Suddenly the faeries heard a faint rustling sound coming from the kitchen's far corner, near the back door which led to the backyard. Not wanting the intruder to come out and attack them, Illere shouted "Rise plants!" and watched as the intruder was attacked by the houseplant's green vines. "Hanso, what are you doing in Kira's house?" Illere demanded. "Oh, so this wasn't my house, then?" Hanso asked with a weary smile. Kira, who was now wide awake, shook her head. "Why are you here, Hanso? And how did you get past my magical barrier?" "Simple: I just snuck in before you put your shield up," Hanso explained. Illere shook her head. "I can't believe it was you, Hanso! I thought you were done being a thief after you saved Faerieland from Xandra!" Hanso laughed. "Are you kidding me? Heck, I just stole a silver goblet from your neighbours last night! Sure it wasn't real, but it was worth it, I guess." "Then why did you come here?" asked Kira. Now Hanso was giving Kira a pleading look. "Please!" he said, getting down to his knees. "Listen ladies, I really do need your help tonight! You see: these crazy Dark faeries, one of them being extremely temperamental for some reason, had asked me to 'borrow' some of your personal items in exchange for my mercy. And I was wondering if I could, oh I don't know, maybe borrow one of your sweaters and then give it back later. Is that okay?" "That depends," said Kira. "What else did these Dark faeries ask for besides a sweater?" Hanso's face grew red. 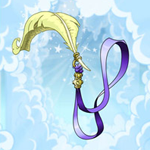 "Oh, I don't know... a certain Air faerie circlet that you might have? And if you do have it, and can give it to me, then I'll leave you alone and never come back! So what do you say?"